I have so many friends in german speaking areas. They (and me) have some trouble to read (and understand ;-) ) english manuals. Arno is it possible that we can have a german translated Manual. I know that Helli ( a member of here and a friend of scruffyduck) has translated the manual for ADE. But where is Helli. I have never see them for a long time. 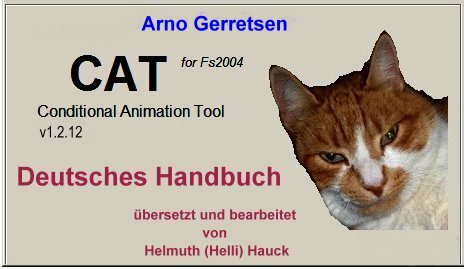 I´m willing to pay 25 euro for a translated CAT Manual. My German is too bad to do a translation, but if any forum members wants to make a translation that's fine with me. Thank you scruffyduck for your message that Helli is still alive. I have send him a Forum Mail. I Hope he recieved this. Jon (Scruffyduck) presently is in the final moves to release an update version of ADE and therefore I am again involved to bring both ADE-Manuals up to date. I saw your request in my mail today and subsequently looked here. Let me see, what it is all about and I will get back to you. Well, do your work for scruffyduck and if you have time you made maybe a german manual of Cat. I hang by the geman translation of Animation trigger. Bewegungs Auslöser - thats right ? Hihihi. What a scary word. I have promised Sandra to provide a German version of your CAT Manual. By now I am halfway through the translation and I realize that I might run into the same problem with translating word by word, which we all are so familiar with manuals translated from Japanese or Korean. I dare to ask you (I know you don't have the time really) for some insight, since I scratched Gmax-modelling only on the surface and did not touch animation at all. - you wrote "CAT allows you to change the animation in such a way that you can trigger it with a FS variable". The variables used by the CAT interface I found also among those listed by you in the thread "Variables available in FS". A few of them I found in the"Make MDL" SDK for FS9. - Where are the other variables defined? - How does CAT "interface" with the model (file), whose animation is going to be tweaked? Neither in the CAT manual nor in the CAT video tutorial this issue is mentioned. Probabely it is generally known but unfortunately not by me. 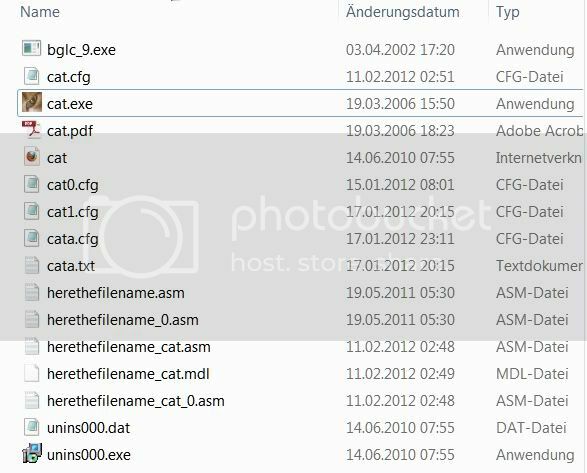 CAT will make a new mdl File from the two asm files. 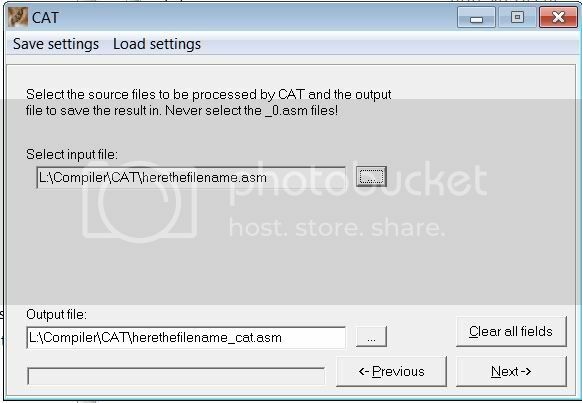 You load the .asm file into CAT when they need them, Arno mentioned that you never use the _0.asm to do that, but the two asm flies MUST stay together if you use CAT. 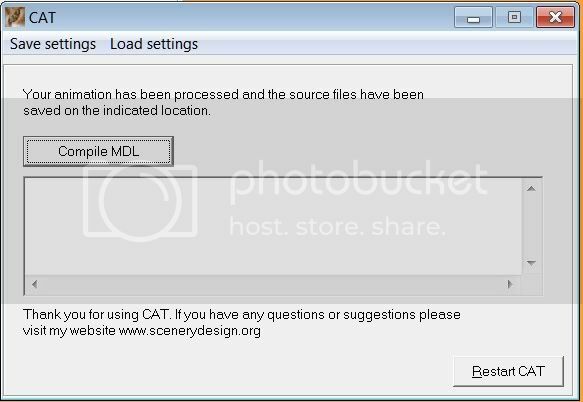 Now I can make my bgl file with the CAT manipulated mdl. 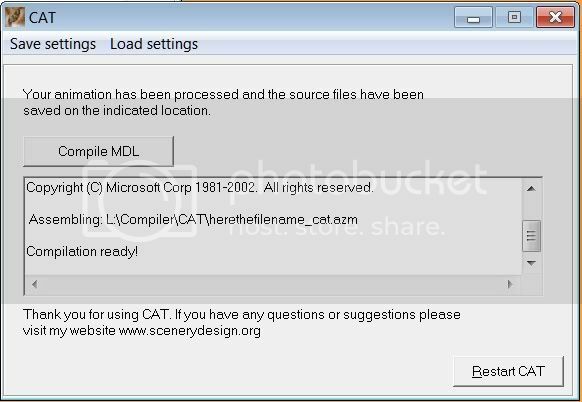 I delete the two old asm files and the old mdl file - than copied the three new files to the xml file and then I remove the _cat from the filenames - now i have the files that i can use with the xml file to make my bgl file or i can get the mdl file to use it with the Library Maker. That thread you mentions give a good overview. They are not really defined in one place. Some come from the FS2000 SDK, from the BGLC_9 sources or some even from the FS98 SDK. The user variables are 5 variables availble in FS that users can fill themselves from external tools/DLL files. For example the ActiGate module I made fills some of them. They can not be filled by the user with a user interface or so. So maybe the name is a bit misleading. You load the ASM files that you can keep from the MakeMDL export process. Btw, I am working on integrating CAT with ModelConverterX. That will change the interface quite a bit. Not sure when that will be ready though. many many thanks for your notes. That shouldn't stop me to make that German manual, should it? I have a question, which is based on the fact, that in your list of variables in the thread "Variables available in FS" (http://www.fsdeveloper.com/forum/showthread.php?t=332) there are more variables than you make available in CAT. - What if I insert a variable from the list - for instance "0389" (hour of the day GMT), which is not available from the rolldown-textline "Select Variable", directly (manually or copy/paste) into the input-line "Variable" ??? - Will CAT use it to tweak the ASM.file and will this be further convertible? - What do you call "0389" => Code? Name? Index? Designator? Variable? - What do you call "hour of the day GMT" => Name? Description? Variable? You can use them. When you choose one from the list, you will see that the variable is inserted into the variable text box. But you can also type any value you want in there. I would call that the variable. But technically speaking it is the memory offset where the value is stored. Could you give me an example what this means or how it is done? Let's see if I can explain this, those masks are a bit tricky . Let's assume we have a mask value of 1, bit wise that is 0001. So you don't compare if the values are the same, but only if the bits of the mask are set in the variable. could you name me one or two of the variables in your list, where the values could be manipulated with this bitmasking method? While writing the translation, I realize, that neither the English Manual not the Video Tutorial contain the two radio buttons "Apply to animation trigger" and ""Apply to animation", which are shown in the lower part of the CAT window of version 1.2.12. I know how to translate them of course. But - "when" in the process of defining the tweak do they come into action and "what " is applied with these selections? In the CAT input lines "Variable" all automatic entries end with an "h". In the variable list in the forum the variables are shown without "h". Some values of the variables also have this "h" - you even point this out in the video tutorial. Many other values don't seem to to require the "h". What is the mistery behind this? One example is when using ActiGate to check if the parking brake is set or if it is raining. Another common example is animation timers. These often use a bitmask to get the right blinking frequency. But for conditional animations they are not used that often. The only case I used them is with the parking brake trigger when using ActiGate. That is indeed a function I added a bit later. The difference is where the animation condition is applied. If it is applied on the trigger it will affect all instances of the object, if applied on the animation it only affects the current instance. So if you have placed multiple jetways for example, this might make a difference. You only want the one closest to you to respond. Simply said the h needs to be there in the end, because that tells BGLC_9 that the number is hexadecimal and not just decimal. But I can't remember what happens if you don't type the h. I am not sure if CAT will add it or not. Thanks Arno for your information. Still, do you by chance have an example of a suitable variable and a bitmask value, which has to be entered in the Value-window - like for the other two options you show in your video (which did not yet have the Bitmask option). This would make my explanation much better (and complete). I can't really think of an example that would make sense. I think it is an option you would only use together with a module like ActiGate. It is available as PDF-file in the attachement. If something is wrong with the text, please tell me here. Thanks, I have added a link to the PDF in the CAT manual on the Wiki.